You are on Opening Times (Office). Skip to the next section. The centre closing times vary depending on events and activities. Please call 020 7607 9453 for more information. The centre is closed the last 2 weeks of August & the last 2 weeks of December. The venue is situated outside the centre of the town or city. The nearest mainline station is Caledonian Road and Barnsbury. 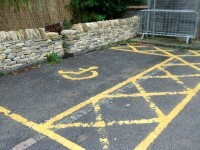 There is/are 1 designated parking bay(s) within the car park. The dimensions of the designated parking bay(s) are 230cm x 460cm (7ft 7in x 15ft 1in). The nearest designated bay is 5m (5yd 1ft) from the main accessible entrance. There is not a dropped kerb / non stepped access from the car park to the venue. 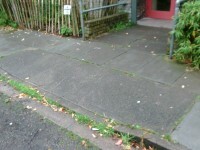 The width of the ramp or slope is 200cm (6ft 7in). To get to this entrance, you have to go through a gate, which is 76cm wide. 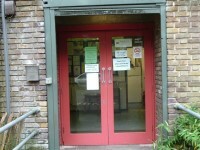 You are on Outside Access (Main Hall Entrance). Skip to the next section. The door opening is 146cm (4ft 9in) wide. You are on Level Change (Main Hall Entrance). Skip to the next section. The ramp or slope is located leading from the car park to the entrance. The width of the ramp or slope is 190cm (6ft 3in). The photo shows the I.T. suite. The accessible toilet is 5m (16ft 5in) from the accessible entrance. 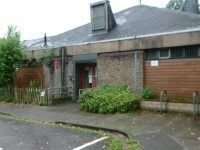 The accessible toilet is located to the left of the main entrance. There are separate male and female adapted toilets. The dimensions of the accessible toilet are 160cm x 180cm (5ft 3in x 5ft 11in). The lateral transfer space is 92cm (3ft 0in). The hand dryer is 108cm (3ft 7in) high. The sink is 83cm (2ft 9in) high. There is also an adapted cubicle within the standard female toilets. The female and male toilets are located outside the main hall. The female and male toilets are 5m (16ft 5in) from the accessible entrance.